HipHop Virtual Machine was developed and open sourced by Facebook. It’s an open source virtual machine designed for executing programs written in Hack and PHP but it’s not a replacement for PHP. HHVM uses a just-in-time (JIT) compilation approach to achieve superior performance while maintaining the development flexibility that PHP provides. Facebook developed HHVM because the regular Zend+Apache combination isn’t as efficient to serve large applications built in PHP. The advantage of HHVM is an increase in web request throughput and reduction in memory consumption compared to traditional PHP hosting. As a process virtual machine that provides the execution environment, HHVM has the ability to use live type information to produce more efficient native code, leading to higher web server throughput and lower latency. In this tutorial we are going to setup HHVM under following set of resources on our cloud host. HVM doesn’t support 32 bit operating systems, so you must be running a 64-bit OS to compile & install HHVM. Make sure that you have super user privileges to use sudo or root user and your system must be updated with latest updates otherwise we might get errors during the setup. Let’s run the following commands to update and then upgrade your Ubuntu Operating system. The installation of HHVM is a very simple process that can be done in different ways. We are going to install it from its prebuilt packages for Ubuntu 14.04 (amd64) by executing following set of commands. software-properties-common is already the newest version. 0 upgraded, 0 newly installed, 0 to remove and 52 not upgraded. 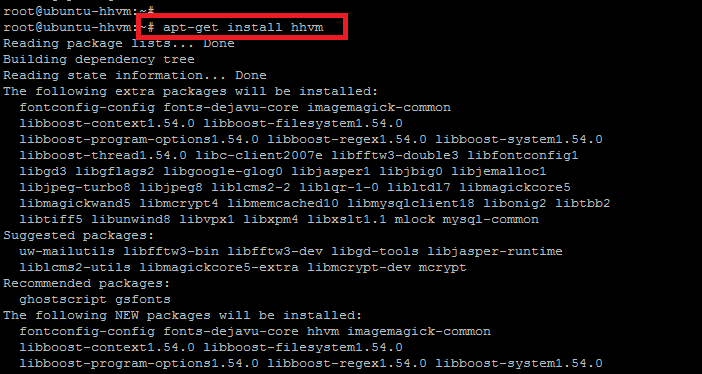 root@ubuntu-hhvm:~# add-apt-repository "deb http://dl.hhvm.com/ubuntu $(lsb_release -sc) main"
HHVM should have been install with above commands, to make sure its installation we can check it by following commands. If you able to get the version number in result of above command as shown then its means that we have successfully installed HHVM on Ubuntu. Create a new file PHP script file with some text in it like “Hello World This is Test” to test it from the command line using HHVM. Press “ i ” to change the editor into insertion mode and write the test script. Now press “Esc” and write quit the operation to save changes as. Now, execute the PHP script and its output should be like the same text that we inserted in it. To start using HHVM with our default web browser we need to execute the following command in case of Apache Web server. The executed command will check apache server is installed or not then enable some modules and restart Apache web server services. 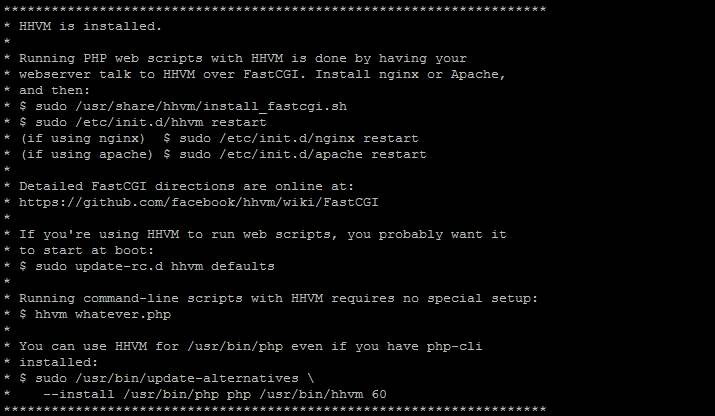 Stepping forward now we make sure the installed HHVM setup is working fine with Apahe/Nginx PHP scripts. To do so let’s create a new php script file into the document root directory of your web server that /var/www in Apache and /usr/share/nginx/html if you are using Nginx. Add the following php script to this file and then save changes. Then Open your favorite web browser and access this file by giving it location path on web like below. The output should be like this Great! You are Using HHVM and you get the output like 'Sorry! Not using HHVM then its mean your HHVM is not functioning. Awesome! Our output shows that our HHVM server setup is perfect and can used with your web browser. 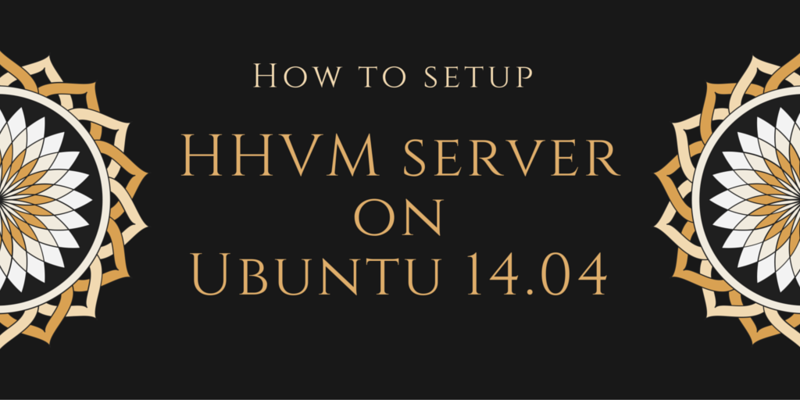 In this tutorial we learn about HHVM server’s installation and it’s configuration on Ubuntu to serve our PHP based websites like Facebook to serve more users with less system resources. If face any difficulty during its setup don’t hesitate to leave your valuable comments, we will get back to you.